← Hebrews 5:5-10 – Why Does Hebrews Call Jesus a Priest? It is always very interesting to read about the Priest Melchizedek in the book of Hebrews because as we know there is hardly any mention of him in the rest of the Bible. This fact could really highlight just how much stories were passed down within the Jewish people. There is only two real mentions of him in the Old Testament. Could this man have been highlighted quite a bit in the Jewish mindset causing the importance of Jesus jump of the page to Jewish readers? Another aspect about Melchizedek was the point that he was a King as well as being the high priest. Going along with the presidential examples could he have been a been something like a favorite president that people always look back on like a Reagan. Moses could be like the Lincoln of our times and Washington the Moses of our country. This is a stretch but, it is cool to think about. Melchizedek was a ruler, it sounds like he was a ruler of a whole area but, he was also known as “king of peace (7:2).” Melchizedek had to be active in government because he led the government. Jesus did not come to control the government when He came to save. Could this tie to Melchizedek shows the importance of Jesus when he returns because he is going to reign on earth in the 1,000 year kingdom? I could not agree more with the conclusion of the post. Jesus was the perfect human so he was the perfect person to be the high priest for the humanity. There is another reason why Jesus was known as the high priest of God. According to Jobes, “the author of Hebrews explains that Jesus did not enter the temple in Jerusalem with the blood of an animal but entered into the Most Holy Place of heaven itself by his own blood” (Jobes 98). Jesus could enter the temple like any other person, but he did not need to. He could enter into the innermost Tabernacle of heaven itself; a Tabernacle so great that no one else could see it or feel it except for Jesus. With this ability Jesus becomes, according to Hebrews 9:15, “the one who mediates a new covenant between God and people; so that all who are called can receive the eternal inheritance God has promised them. For Christ died to set them free from the penalty of the sins they had committed under that first covenant” (NLT 1417). Jesus was the perfect human, but he could also enter places no person could ever enter and have an experience no one else could ever have. He went through all this for one reason, to save humanity for its sins. I think that since God was a perfect human and died for our sins he would be the highest priest for us. He did so much for us that by dying for our sins to be able to be declared the high priest is almost a given. He sacrificed so much in order for us to be saved that by having him as the high priest is good. I like to think that by God being a perfect human he would be the highest priest and show people today how they should be and act towards each other. I like the comparison of political leaders to high priests in this blog post. It reminds me of how many high political officials I have seen in office and not support the way they are living and running things. But I look up to Jesus in the sense of how he ran things and represented Himself, holy and flawless. No political leader could come close to this image, then again I have never heard of them in any speeches announce their devotion to God as well as our country. I am glad I have Him to look up to and strive for. 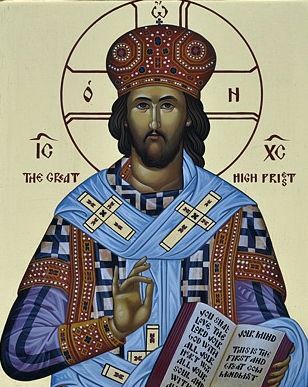 It is intiresting to think of Christ in his role as the High Priest that reconciled all of humanity to God. He had to be human so that he could stand as the mediator between people and God. Hebrews 2:17 says that it was completely neccesary for him to be human in every way,so that he could be,“a merciful and faithful high priest in service to God, and that he might make atonement for the sins of the people.” He knew what it was like to be human, to be tempted and to struggle, yet he never sinned. P. Long points out, in the blog, that the former Jewish priests who had been called to do the sacrifices for the people’s sins, were still sinful people themselves, so there was always the possiblity that they performed their duties imperfectly. Jobes goes along with that thought, in stating that Jesus as High Priest achieved what not even God’s greatest servants of the past like, Moses and Abraham and David could do. As “great” as they were, they were not perfect as Christ Jesus was/is the perfect Son of God, and therefore his sacrifice was the proper and perfect one, that redeemed humanity once and for all.